When you enter the du Maurier Theatre to see Soulpepper's production of Jean Genet's "The Maids", you first notice that the stage has been placed in the middle of the large space, the seating evenly divided on either side. Astrid Jansen's set of a symmetrical Art Deco bedroom is seen through scrims covering both openings. We watch Martha Burns playing a domineering mistress and Nancy Palk playing a submissive servant in exaggerated style until the bell of a timer rings and the two scrims rise simultaneously, Paul Mathiesen's lighting shifting from soft to analytical, breaking off the game-playing of two maids and giving us suddenly a clear view of the half of the audience facing us. It's a brilliant move that gets right to the heart of Genet's play about role-playing, the interchangeability of identities and the difficulty of distinguishing fiction from reality. Genet's 1947 play was inspired by a real murder in France in 1933 in which two maids killed and mutilated their mistress and her daughter. Genet's purpose is not to recreate the event as several French films have done, but rather to examine the psychology of an underclass who has no hope of every achieving power. Genet's two maids, sisters Claire (Martha Burns) and Solange (Nancy Palk), act out their fantasies of self-abasement and revenge against their mistress, known only as Madame, to revel in the illusion of power. Their room and board is their only payment, their clothing Madame's cast-offs. Their total dependency (Madame calls the two her "children") has engendered a mixture of adoration and hatred for her that finds release only in their ritual called the "Game" or the "Ceremony". The two take turns playing the roles of Maid (embodying both maids) and Madame that climaxes in the Maid's murder of Madame followed by a meditation on Madame's funeral and the Maid's trial and execution. When the play begins, the maids have taken their first step outside the Ceremony to harm Madame in real life. Claire has written letters to the police urging them to take action against Madame's lover for an unknown crime. They have rejoiced in his arrest and incarceration because of the misery it has caused Madame', but a phone call in Act 1 informs them that he has been released for lack of evidence. The spectre of Madame's renewed happiness and the fear that the origin of the letters will be discovered, leads the two to carry out their murder of Madame for real, not by strangulation, as in the Ceremony, but with a barbiturate-laden chamomile tea. Contrary to their pose during the Ceremony, they are instantly submissive, even fawning when faced with Madame (Charmion King) in person. The failure of this murder brings the play full-circle as they play out their frustrations in another enactment of the Ceremony, this time one where the fantasy and reality of death become one. 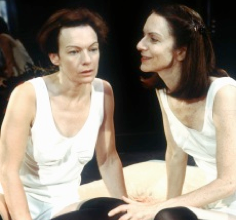 Martha Burns and Nancy Palk are excellent as the two maids, though ideally the actors should be closer in stature the better to emphasize the theme of interchangeability. Both suggest a madness in their ways through different means--Burns through a quicksilver volatility of temper, Palk through a dreamy dissociation from things. Despite their roles in the Ceremony where one is the victim, the other the avenger, Burns and Palk make the important point that love, sisterly or beyond, is the indissoluble bond between them. Both indicate the shifts between the "real" words and deeds of the two and the their "acted" equivalents with utmost subtlety. Charmion King is hilarious as Madame. Her Madame is undeniably self-obsessed and self-dramatizing, but is far from the ogre of the maids' Ceremony. This is important because we must see that the Ceremony has taken on a life of its own and is no longer an accurate reflection of the world. King is adept at changing her tone from saccharine to acidic and back in a flash. Astrid Jansen has perfectly enhanced her character with a rather outré 1940's outfit with the fur of a fox appropriately biting its own tail. If there is a flaw in the production it is that Leblanc has smoothed away some of the play's edge. She is so concerned to make the shifts between "real" acting and "play" acting clear that she tends to downplay actual rivalry between the sisters (over the attentions of the delivery boy, for example), by linking it more to their "play" acting. To suggest that there is some animosity between the two despite their bond would make their enactment of the Ceremony that much more complex and unsettling. Leblanc has lent the ending such ambiguity that some may wonder what actually has transpired. Some may be baffled; I think more will be intrigued. "The Maids" explores the old theatrical paradox of illusion and reality in disturbing way because Genet links it to political and social themes. In absence of a revolution, is play acting the consolation of the dispossessed? What does this say about our own act of attending the theatre? Toronto has had few opportunities to see this play and seldom in a production as strong as this. Those who appreciate fine acting and questions about the nature of acting itself will not want to miss it. Photo: Martha Burns and Nancy Palk. ©2002 Cylla von Tiedemann.